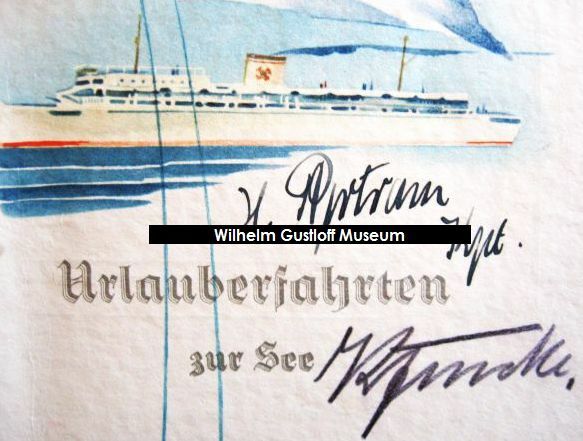 On board the Wilhelm Gustloff, each day brought a new speisekarten. 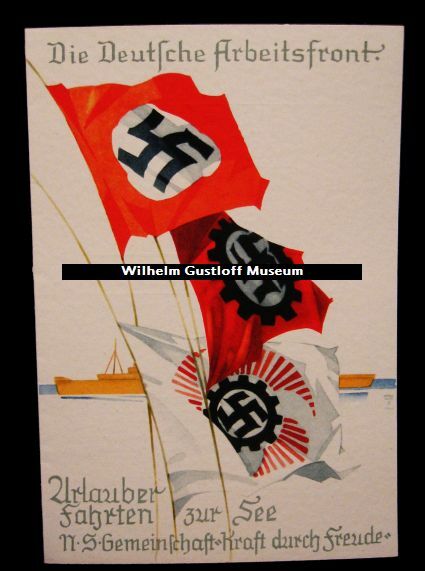 These were combination agendas / menus made aboard with the Gustloff's printing press. Each one measures 5" x 7.5" and shows the agenda on the left and the menu on the right. 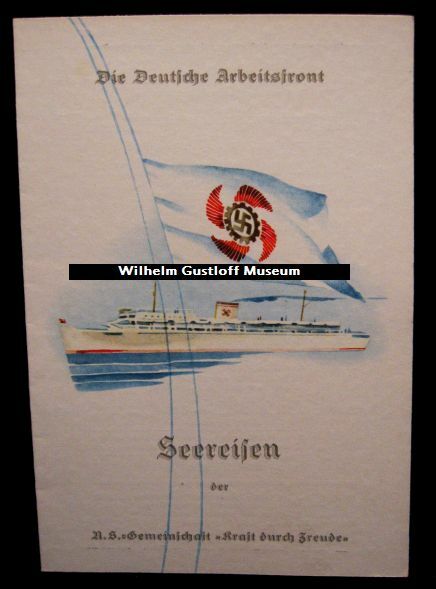 Shown below are 15 standard variations of covers used on board the Wilhelm Gustloff. 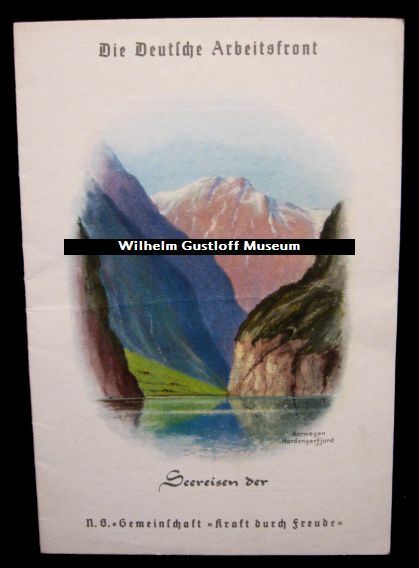 Other special variations are represented throughout the museum site. 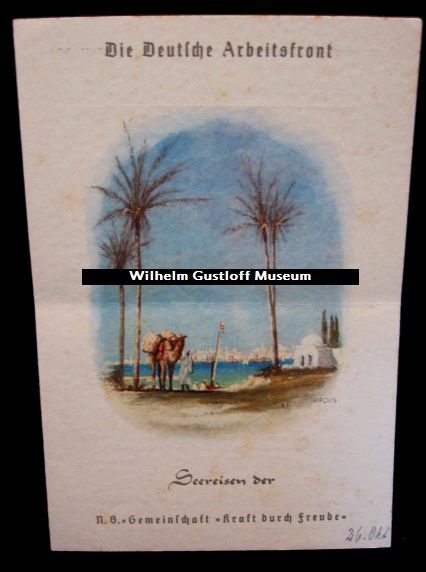 Photo galleries will offer close-ups of each cover and its contents for the menus in our collection. 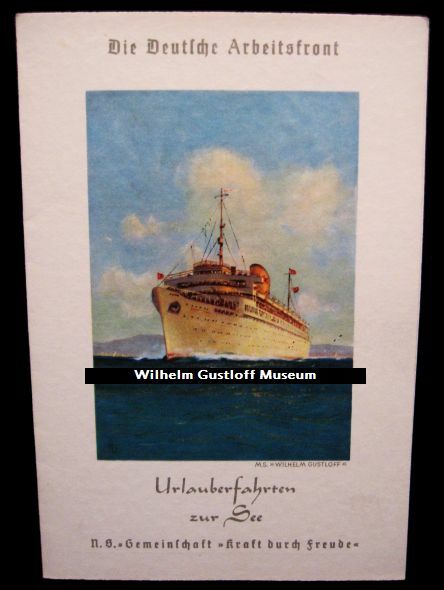 The current number of menus in the collection from the Wilhelm Gustloff is 320. 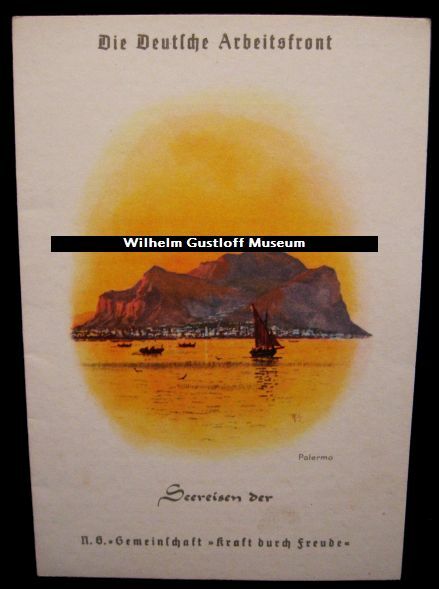 The first menu of each voyage usually sported the liner the trip was on. 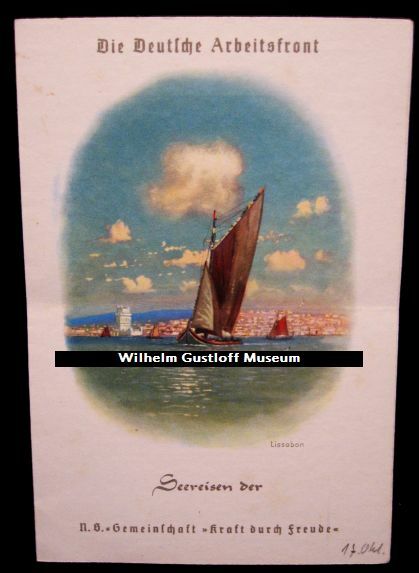 In this case, the Gustloff. 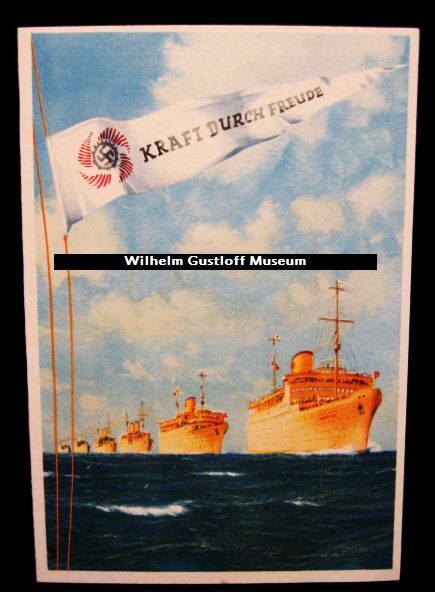 The Wilhelm Gustloff with the Kraft Durch Freude flag. School ship of the Navy. Dates Below: Sunday: August 21st, 1938 - Monday: August 22nd, 1938 - Tuesday: August 23rd, 1938 (x2) - Wednesday: August 24th, 1938 - Thursday: August 25th, 1938 - Friday: August 26th, 1938 -Saturday: August 27th, 1938. Voyage #15 - Cruise to the Norwegian Fjords. Dates Below: Sunday: September 4th, 1938 - Monday: September 5th, 1938 - Wednesday: September 7th, 1938 - Friday: September 9th, 1938 - Saturday: September 10th, 1938 . 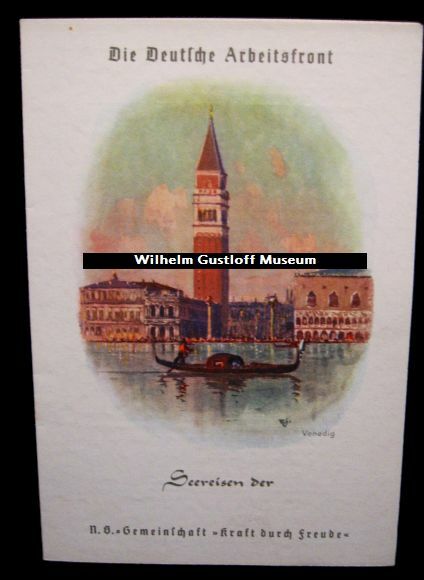 Each menu is affixed into a photo album for this voyage. Dates Below: Sunday: August 14th, 1938 - Monday: August 15th, 1938 - Tuesday: August 16th, 1938 - Wednesday: August 17th, 1938 - Thursday: August 18th, 1938 - Friday: August 19th, 1938 - Saturday: August 20th, 1938. Dates Below: Wednesday: November 2nd, 1938 - Thursday: November 3rd, 1938 - Friday: November 4th, 1938 x2 - Saturday: November 5th,1938 - Sunday: November 6th, 1938, Monday: November 7th, 1938 - Tuesday: November 8th, 1938 - Wednesday: November 9th, 1938 - Thursday: November 10th, 1938 - Friday: November 11th, 1938 - Saturday: November 12th, 1938. 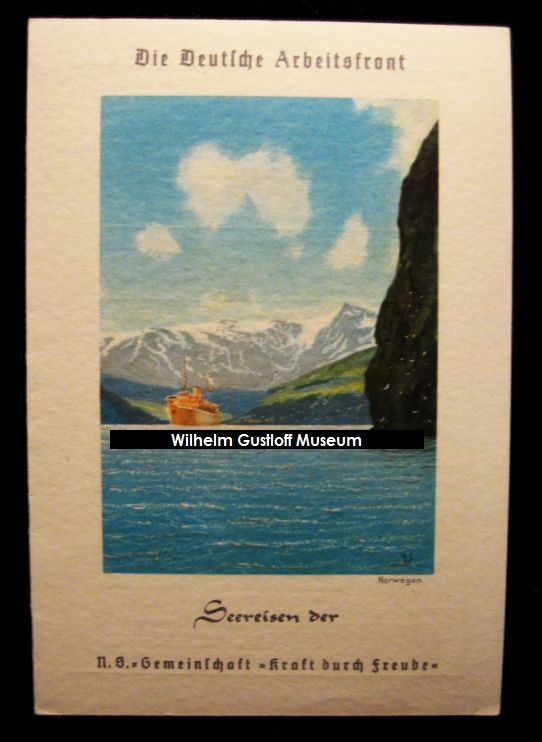 Norway: With the Wilhelm Gustloff sailing in the fjords. Dates Below: Wednesday: June 29th, 1938 - Thursday: June 30th, 1938 - Friday: July 1st, 1938 - Saturday: July 2nd, 1938 - Sunday: July 3rd, 1938 - Monday: July 4th, 1938 - Tuesday: July 5th, 1938 - Wednesday: July 6th, 1938 - Thursday: July 7th, 1938 - Friday: July 8th, 1938 - Saturday: July 9th, 1938 - Sunday: July 10th, 1938 - Monday: July 11th, 1938 - Tuesday: July 12th, 1938 - Wednesday: July 13th, 1938, Thursday:July 14th, 1938. Listed under London Polling Station page. 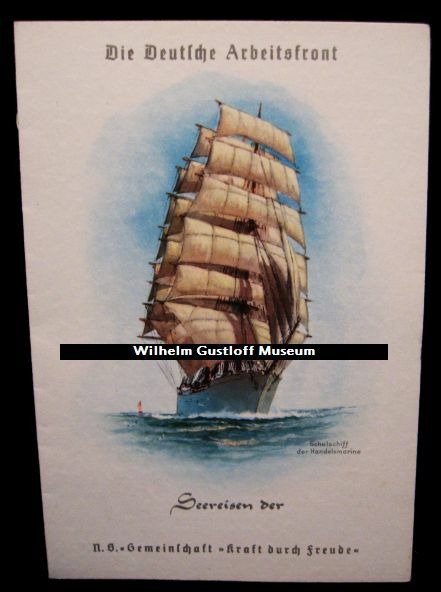 Listed under Maiden Voyage page. 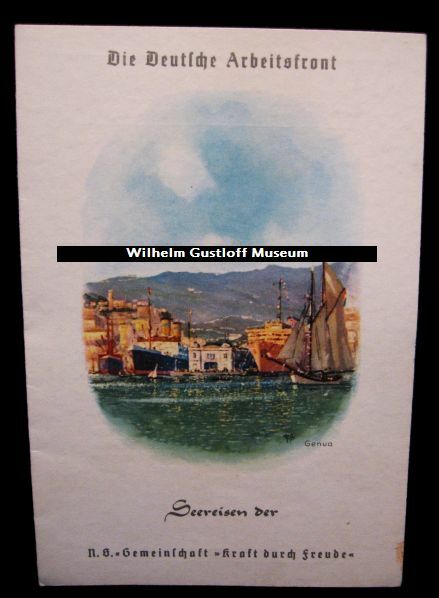 Menu cover for July 29th, 1938 signed by Captain Heinrich Bertram. Also signed R Fincke. (Onboard photojournalist). 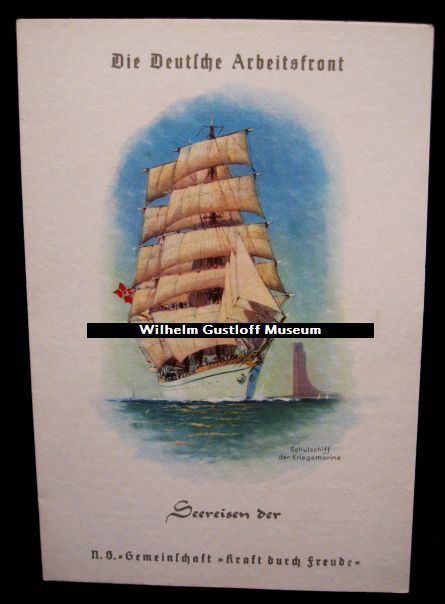 Presented in the last four images of the 19th voyage is an additional incomplete set of speisekarten from the trip. When I purcahsed this set, it included October 13th, 14th, 15th, 16th, 17th, 19th, 21st, 22nd, 25th, 28th, and 29th. 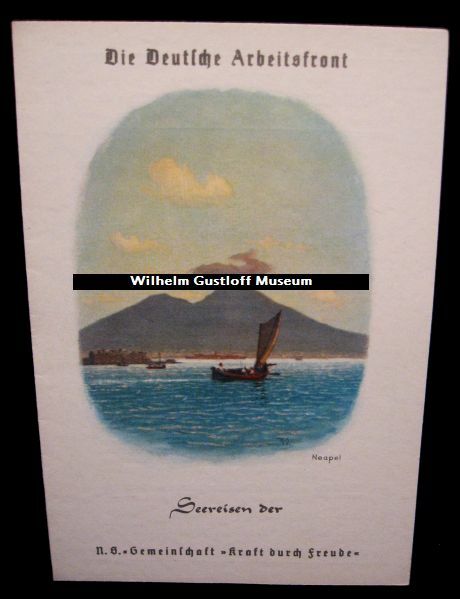 What makes it interesting is that the passenger who saved them used the back sides for each as a journal to record the voyage. 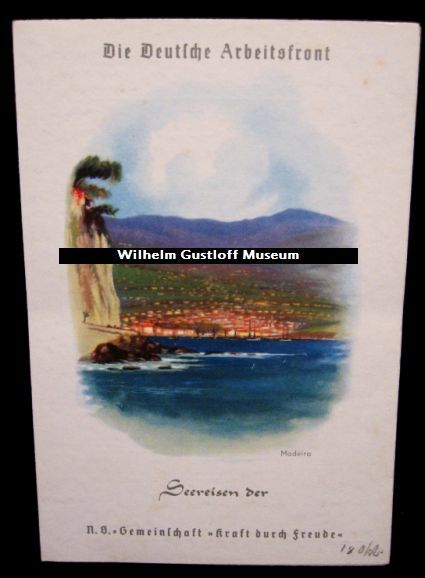 Close-ups are shown above and the additional items from this set are in the Tickets and Travel page. Dates Below: Monday: July 25th, 1938 - Tuesday: July 26th, 1938 - Wednesday: July 27th, 1938 - Thursday: July 28th, 1938 - Friday: July 29th, 1938 - Saturday: July 30th, 1938. Dates Below: Sunday: May 22nd, 1938 - ​Monday: May 23rd, 1938 - Tuesday: May 24th, 1938 (x2) - Wednesday: May 25th, 1938 - Thursday: May 26th, 1938 (x2) - Friday: May 27th, 1938. Dates Below: Thursday: April 14th, 1938 - Friday: April 15th, 1938 - Saturday: April 16th, 1938 - Sunday: April 17th, 1938 x2 - Monday: April 18th, 1938. Dates Below:Thursday: December 8th, 1938 - Friday: December 9th, 1938 - Tuesday: December 13th, 1938 - Wednesday: December 14th, 1938 - Friday: December 16th, 1938 - Sunday: December 18th, 1938 (Damaged). Dates Below: Wednesday: June 15th, 1938 - Thursday: June 16th, 1938 - Sunday: June 19th, 1938 - Tuesday: June 21st, 1938 - Wednesday: June 22nd, 1938 - Thursday: June 23rd, 1938 - Friday: June 24th, 1938 - Monday: June 27th, 1938. Dates Below: Sunday: September 11th, 1938 - Monday: September 12th, 1938 - Tuesday: September 13th, 1938 - Wednesday: September 14th, 1938 - Thursday: September 15th, 1938 - Friday: September 16th, 1938 -Saturday: September 17th, 1938. Dates Below: Monday: November 14th, 1938 - Tuesday: November 15th, 1938 - Wednesday: November 16th, 1938 - Thursday: November 17th, 1938 - Friday: November 18th, 1938 - Saturday: November 19th,1938 - Sunday: November 20th, 1938, Monday: November 21st, 1938 - Tuesday: November 22nd, 1938 - Wednesday: November 23rd, 1938 - Thursday: November 24th, 1938.